Following sell-out shows at Arcola Theatre, the acclaimed, award-winning British-African family drama, Pandora's Box, embarks on its long-awaited UK tour this autumn. This 'touching, hilarious' (The Stage) hit play has been dazzling audiences with its 'enthralling, brilliant' (Public Reviews) story and performances. Summer break is ending. On holiday with her streetwise son in Nigeria, a British-Nigerian mother is in turmoil. 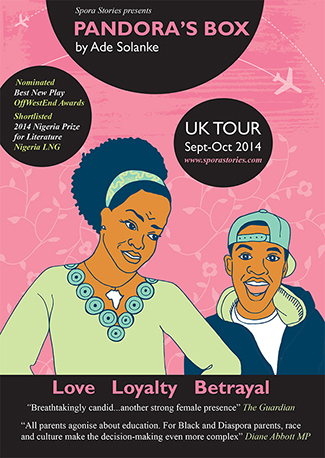 Should she leave her only child in a strict Lagos boarding school, or return him to the battlefields of inner London? A family spanning three generations and two continents meets in Lagos for the first time in over thirty years. But the joy of reunion also unleashes long-suppressed truths. An exuberant and thought-provoking mix of comedy, tragedy and family drama, Pandora’s Box reveals the heartbreak behind the difficult choices some parents must make – and the price their children pay. Join us at our family participation events, including creative workshops with artists and panel discussions on educating African heritage kids, with Diane Abbott MP, Prof Osita Okagbue of Goldsmiths, University of London, and Richard Taylor OBE, Founder of the Damilola Taylor Trust. 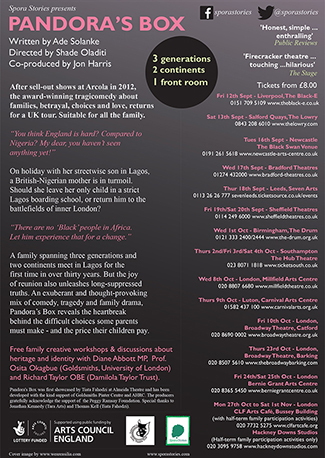 Recently nominated for the Nigeria Prize for Literature, Africa's biggest literary award, and nominated for Best New Play, OffWestEnd Awards, this unmissable and moving tragicomedy about families, betrayal, choices and love is a must-see. Winner Best Play, Nigerian Entertainment Awards and Best Playwright Afro-Hollywood Film Awards, it's suitable for all the family. Tickets from £8.